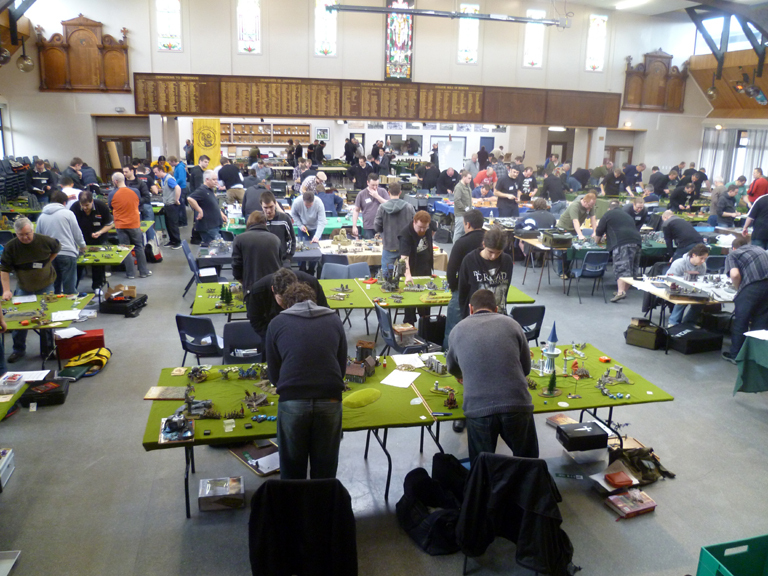 This weekend our local club (the Wellington Warlords which is celebrating its 40th birthday this year) hosted Call to Arms, a large annual convention and tournament. 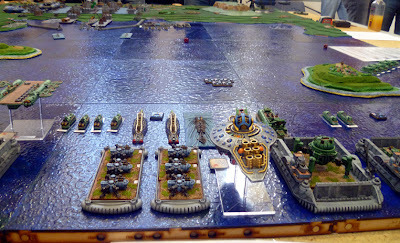 Several of us decided this would be a good opportunity to stage a large demonstration game of Dystopian Wars, showcasing the full seas/air/land capability of the game, and showing off some of our favourite miniatures including the new landing craft. 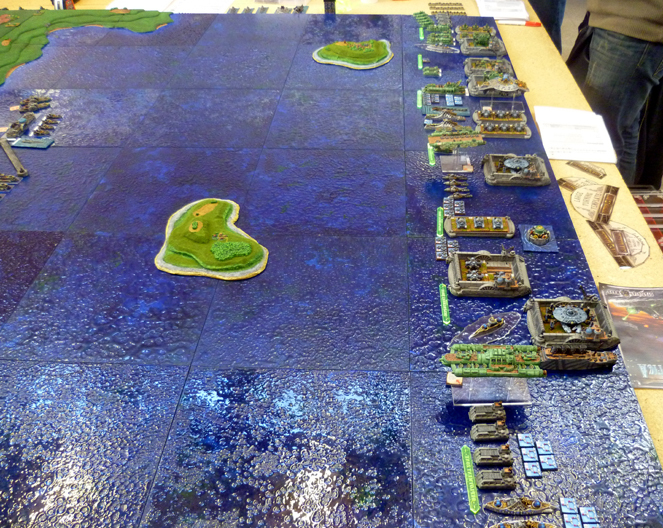 Last year for this event I posted a report about our game for the Northern Mariana Islands (battle report here and here), this year we wanted to go bigger and better! To that end we decided for a 6 player, 2 day extravaganza, which would feature the forces of the Kingdom of Britannia, Prussian Empire, Federated States of America, Covenant of Antarctica and Empire of the Blazing Sun. To fit this force disposition, I drew on the Invasion of Port Stanley (from Hurricane Season) and made a few amendments to suit the players and fleets we’d be using. 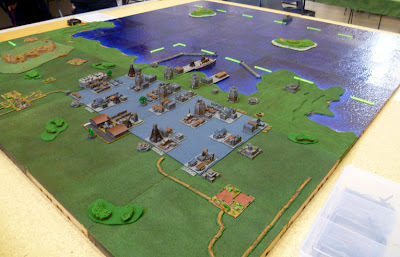 The scenario and fleet lists are below with a few pictures to set the scene. The battle report proper begins in the next post. The year is 1871 and Port Stanley, on a north-facing slope of the Falkland Islands, has become central to the South American ambitions of the Empire of the Blazing Sun. The Empress has dispatched her prize 8th Division to Chile, and from there the fleet plans to seize the British port to use the island’s harbour as a vital refuelling station, and the recently built British airfield to support further acquisitions. Aware of the Islands ports vital importance, the British reinforced the defences and stationed a sizable garrison. Meanwhile, disaffected Covenant of Antarctica Scientist Hazel Cavendish and a group of fellow scientists have been in secret negotiations with the British about defecting to the Kingdom of Her Majesty and bringing several advanced Covenant secrets with him. Cavendish stole a corvette and has arrived in Port Stanley to negotiate the terms of her passage to England. Realising that the combined naval power of garrison and the British 19th Battle Fleet are too strong to overcome alone, the Blazing Sun strike a deal with the Prussian Empire. Elements of the 9th Iron Fleet will stage a landing at Port Louis to the north, and draw away both the British Fleet and much of the garrison, then the Blazing Sun forces will attack using an amphibious landing force to overwhelm the port and seize the airfield. The Prussian naval forces will withdraw when engaged, but advance elements of their powerful 35th Corps with Metzger Robots should be able to easily defeat the British tanks and attack Port Stanley from the south, ensuring the Port’s defences are overwhelmed. As the invasion begins the Blazing Sun encounter the 2nd Covenant War Fleet, who plan to overwhelm the British and deploy their terrestrial command to scour Port Stanley for their rogue scientist. A bargain is struck. The Blazing Sun and Covenant forces will together defeat the British, with the Blazing Sun and Prussian forces retaining possession of the Port, while the Covenant will have the assistance of the Blazing Sun to secure Cavendish and her secrets. The Prussian deception works as planned and the British 19th Fleet scramble to intercept the large Prussian invasion force. However, concerned about possible Covenant reprisal against Cavendish, they radio their allies, the American 7th Federated Fleet, for support. Admiral Richard West deploys a rapid response force to reinforce Port Stanley, arriving only just ahead of the huge Blazing Sun and Covenant armada. While the British garrison forces are deceived by the Prussian landings at Port Louis, and send much of their armoured forces to repel the invaders, the bulk of this force become bogged down in the heavy swampland around Port Louis, and only a sporadic engagement is made, while the lead Prussian armoured column, led by the Metzger war robots, easily evade the huge British tanks, and head overland for Port Stanley. Now the British armoured forces hasten to return to the port to defend their city, only to witness the huge invasion armada bearing down on the badly stretched British and American forces. The battle for Port Stanley is fought in two phases. 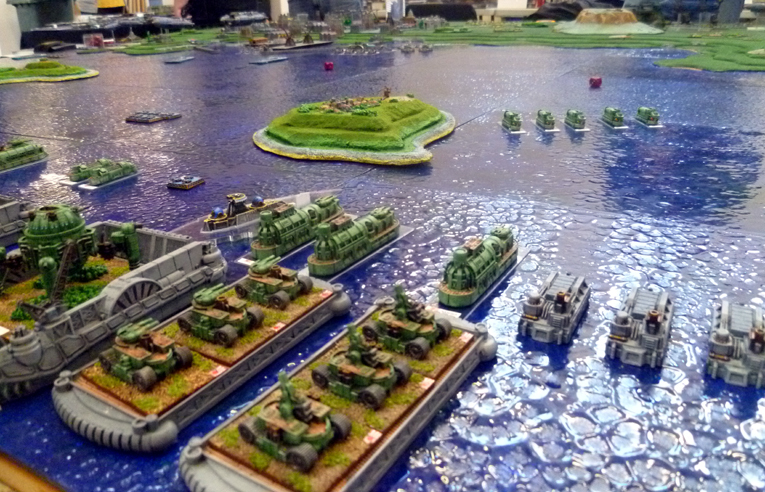 First the invasion fleet and landing craft arrives on the southern table edge while a Prussian land force arrives to the north-east. A small defence force and city fortifications will attempt to hold the attackers at bay. As the landing craft unload their armoured cargo, a reinforcement armoured force arrives to relieve the city from the north-west table edge, at the same time as Prussian reinforcements also arrive from the north-east. The battle is fought for the control of 4 key objectives. 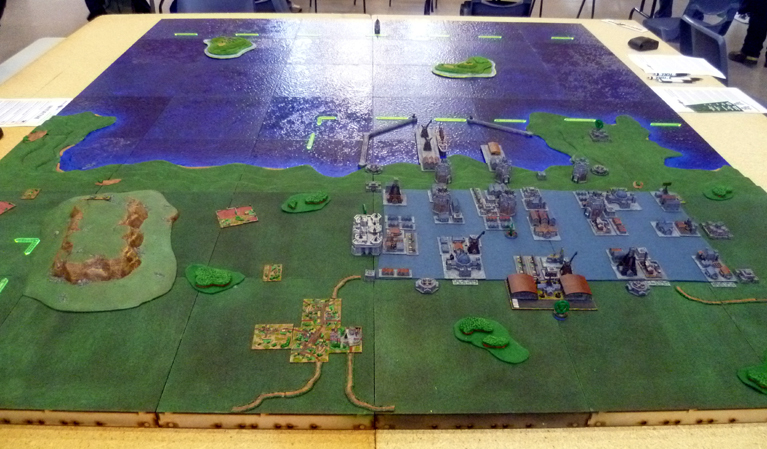 Control the Port (1 Victory Point). To be awarded this point the attacking force must either reduce the bunker (to the south of the city) HP to 0 or Prize this Bunker. The defenders are awarded this point if they retain control of the bunker. Control the City Defences (1 Victory Point). To be awarded this point the attacking force must either Derelict or Prize the Bunker Complex to the East of the city. The defenders are awarded this point if they retain control of the bunker complex. Control the Skies (1 Victory Point). To be awarded this point the attacking force must either reduce the Air Field (to the north of the city) HP to 0 or Prize this Air Field. The defenders are awarded this point if they retain control of the Air Field. Occupy the City (2 Victory Points). These points are awarded to the side which has the greatest value of points inside the city at the conclusion of the game. 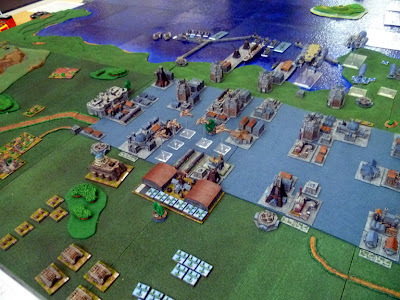 The city is defined by the grey felt area, and unit points are determined by model cost (models with half HP or less are worth half points). 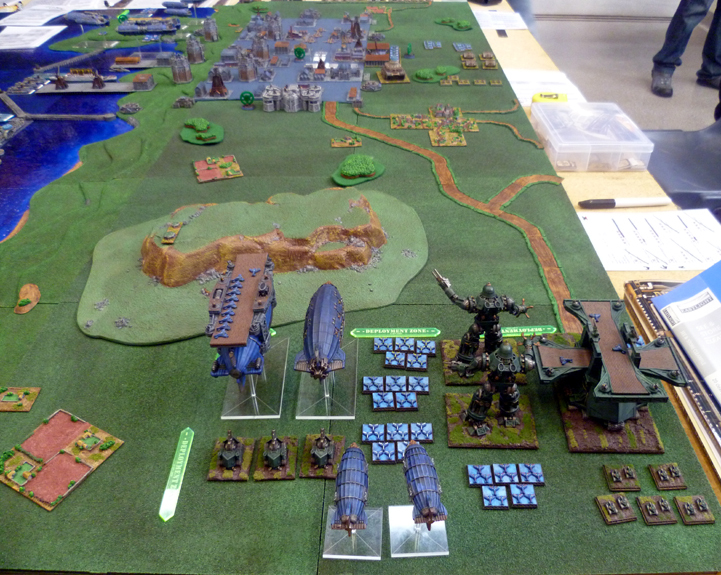 Final Victory is determined by calculating the victory points earned by each side from the four objectives in the end phase of the last turn of the game on Sunday afternoon.